Do we have a shortage of workers, or just cheap employers? Part one of two. Summary: So much of our consensus thinking results from full-spectrum propaganda from well-paid shills working for our ruling elites, well-funded institutions of disinformation and propaganda. This is one reason why we’re losing, and the Republic dying. Here we examine one issue of importance both by itself and as an example of a larger phenomenon. See part two here. 6. What about employers paying fair wages, but unable to find skilled workers? Our ruling elites have constructed institutions that manufacture lies at a greater pace and disseminate them more widely than we can provide rebuttals. Lies about the progress of our foreign wars, about their fake debt-reduction plans (eg Ron Paul’s), bogus analysis of economic theory and the economy. We’re not only playing defense, but doing so unsuccessfully. I have a two foot high pile of 2012’s news articles which can be broadly categorized as “lies”. I’d like to write rebuttals, but could not do so even 24-7. I would like to list them for your review, but that would be a full-time job. Here we examine one, of importance both by itself and as an example of a larger phenomenon. Here we’ll discuss some specific claims; tomorrow we’ll review research about the broader economy. “Employers are very quick to raise the specter of a labor shortage, but often it’s another way of saying they can’t find the workers they want at the price they’re paying … they are unwilling to meet the price signal the market is sending, so they seek help in the form of a spigot like immigration. The claims of skill shortages are almost entirely anecdotal. Worse, most of the specific stories are bogus. Asking employers if they’d like cheaper workers is good for an easy story and a smile from the publisher, but little but fiction. Here is a sampler of this swill. Ultra Scientific’s business is growing because Thermo Fischer Scientific is closing their plant in East Providence and laying off 66 workers who do all the things that Ultra does. They are moving production to Virginia and Texas. Neither of them is exactly a hotbed of trained workers. Here’s what Thermo Fischer Scientific’s Spokesman, Ronald O’Brien, said last August, “At least two or three employees will be asked to relocate, some to other positions, O’Brien said. The bulk of the workers, mainly technicians who produce the test kits to detect diseases, will be laid off and offered a severance package”. So they were able to hire one of the three PhDs who chose not to move. But you don’t need a PhD to run an HPLC. A lab tech with a high school education can do that. But one thing that is certain is that a PhD in Chemistry will never make enough to pay back the costs of their education at a lab techs salary. Ultra Scientific is within 50 miles of the largest concentration of chemistry education in the world and he can’t find anyone to work for him? The reason why Russo can’t get people is because he is not paying enough! At Mechanical Devices, which supplies parts for earthmovers and other heavy equipment to manufacturers such as Caterpillar Inc., part owner Mark Sperry says he has been looking for $13-an-hour machinists since early this year. The lack of workers is “the key limitation to the growth of our business and to meeting our customers’ expectations,” says Mr. Sperry. He estimates the company could immediately boost sales by as much as 20% if it could find the 40 workers it needs. Trips to several job fairs yielded almost nothing, so the company set up a 10-week training program to create its own machinists. Out of the first group of 24 trainees, 16 made it to graduation. Mr. Sperry sees extended jobless benefits as one of the main culprits behind his company’s hiring difficulties. Many of the applicants he saw at job fairs, he says, were just going through the motions so they could collect their unemployment checks. This does not add up. If the company can afford to spend ten weeks training people (and the additional cost of setting up a course), that suggests it could have offered more than $13 an hour, particularly given the opportunity cost of the orders it could have filled if it had had people on board sooner. The article later notes that Mechanical Devices “hire[s] through staffing agencies to help control health-care costs and maintain flexibility.” Um, that means they fire people as soon as orders fall. Paul McNarney, owner of The Mower Shop in Fishers, Ind., says he has been looking for a good lawnmower mechanic so he can guarantee a one-week turnaround on repairs. He received only two responses to an Internet ad he placed a couple of months ago, even though the job can generate income of more than $40,000 a year, depending how many mowers the mechanic repairs. Similar ads he placed before the recession attracted more than a dozen candidates, he says. Let’s see. McNarney apparently already has a repairman; this “hire” is to shorten McNarney’s turnaround time. But this “job” appears to be paid on a piecework basis, on referrals from McNarney, and this new worker probably only would get work at a few peak times a years, since the current repairman is presumably top banana. So the $40,000 number is pure BS. In fact, the logical response to that ad would be to compete with McNarney, not work for him. Why let him take the markup on your time for erratic referrals, meaning no job security? But the subtext of the article is that the buyer, meaning the employers, is always right. Like a lot of manufacturers in Minnesota, Haberman is hiring. The openings include five positions for high-skilled machinist jobs that pay up to about $60,000 a year. But company officials haven’t been able to fill the jobs and as a result haven’t taken on the new business they need to grow. A recent survey of manufacturers across the United States found that as many as 600,000 jobs are vacant due to a shortage of skilled workers. 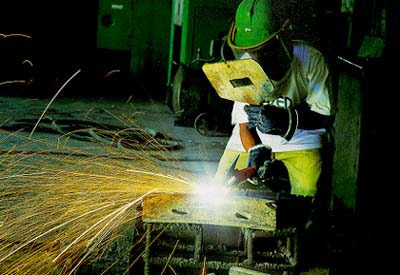 The poll, conducted by Deloitte and The Manufacturing Institute, declared that factories are experiencing a moderate to severe shortage of qualified workers. … In his State of the Union speech this week, President Barack Obama echoed that concern — a lament heard in factories across Minnesota. That makes sense to experts. Steve Hine, the state’s head labor market analyst, said if skilled manufacturing workers were scarce, companies would have more job openings and offer higher wages. “It seems that offering higher wages would be a natural response.” With a labor shortage, out-state manufacturers who often have the toughest time filling positions would see a greater need to offer higher wages to attract workers, he said. But that’s not happening. The data on job openings for highly coveted machinists who can operate or program computerized machining tools doesn’t show an unmet demand for such skills. According to the most recent numbers, the median wage offer for such top machinists was $19 an hour. That’s a healthy salary. But it’s lower than the salary offered a few years ago, before the recession. “If you go back to the fourth quarter of 2007, the median wage offering was $19.23, slightly higher, but nonetheless higher,” Hine said. “So the wage offers in this area have fallen.” But the decline in wages is nothing like the huge drop in job openings for computer numerical control machinists. They’ve plunged about 70% from their peak four years ago. That pattern repeats itself across other jobs, like welders. Mechanical engineers, by contrast, have seen a rise in job vacancies. But wages for those workers have been stagnant since the start of the recession. Hine said with vacancies and wages both dropping, he doesn’t buy the argument that there is a worker shortage in the state. Others say if manufacturers really do feel pinched for workers, they should provide more on-the-job training. Even many in the industry believe that’s true. If wages don’t rise, the complaints about a shortage of skilled workers may well continue. Next Post Do we have a shortage of workers, or just cheap employers? Part two of two. Nicely done, FM, as usual. The world would be a much harder place to understand without your articles. I’m already looking forward to tomorrows article and a strange mixture of eagerness and foreboding. I will point out that the MPR article you quoted also mentioned that smaller manufacturers are having troubles paying higher salaries because their lives have also gotten harder since the financial crash but I agree with the basic thrust of your comments. Yes. Recessions are opportunities for large corporations to crush smaller competitors. Their greater financial resources allows them to maintain or increase marketing and sales budgets and even cut prices. While smaller companies must cut expenses, lacking cash reserves — and having their terms of credit tightened by suppliers and banks — or cut altogether. I assume part II of this article will address the “trade association’s” magic bullet, temporary immigrant labor. It’s is these lobbying firms and the American Immigration Lawyer’s Association (AILA) that give these stories legs. Agreed. But it’s another subject, and a complex one. This raises another point: increasingly social science research (broadly defined) in America is controlled by the funding preferences of our wealthy elites. The military-industrial complex dominate foreign policy issues. Economics is dominated by business interests. We see this in research about immigration, mostly serving the ideological needs of businesses seeking cheap labor. Vimeo video interview: Metal-fabricator Neil Youngberg never planned on taking over his grandfather’s business and is now faced with passing on his legacy. There is also a lot of crisis talk about the foreign Ph.D.s who will go home and compete against us. This was once the stated goal of the Student Visa program. It’s hardly a crisis as there are only a few hundred foreign Ph.D.s granted to foreign students annually. One of the reasons I suspect for the preoccupation with keeping Ph.D.s in a market that doesn’t create employment for them, is that it makes it easier to create junk-science when there is a glut of these degrees in the workforce. Finally, many foreign students get a head-start in the employment market with CPT, OPT progam internships, where they are exempt from Social Security taxes — this includes the employer share. The exemption also applies to doctoral researchers, where the salaries are so low that citizens (with student loans) cannot afford to take the positions. Oh, but don’t you kow . . . just give them more tax breaks and these cheap employers will become “job creators.” Just ask the Indians and Maylasians et al, where they these job cxreators continue to create jobs in their other roles as cheap employers. Ron Paul is a member of the ruling elite? You must be kidding. He is member of the House since 1979 (with some interruptions). Son a Senator. Do you have any idea how much power the least member of Congress wields, let alone someone with decades of seniority? He is also Chairman of the Subcommittee on Domestic Monetary Policy and Technology, supervising (among other things) the Federal Reserve. The hiring of “13 dollar an hour machinists” has plummeted because today numerically controlled machine tools have become universal. You don’t need a machinist to operate a numerically controlled machine tool, all you need is a minimum wage monkey to insert the blank metal slab correctly and pull it out after it’s been machined. Numerically controlled machine tools now operate from CAD/CAM files, which can be designed by 50-cent-an-hour Chinese labor. You then download the CAD/CAM file and run it into the computer controlling the numerically controlled machine tool, and there you are. Many NC machine tools also include 3D scanners. You place the part you want to machine into the 3D scanner and it gives you the dimensions of the parts down to the closest micrometer, then translates the measurements into a CAD/CAM file. Then you feed the CAD/CAM file into the NC machine tool. 5-axis NC machine tools are now able to do things like machine an entire engine block out of a solid block of steel or aluminum. These machines are so sophisticated that they routinely machine customized replacement hips or leg bones for surgery patients. And just recently, websites have sprouted in which open-source CAD/CAM files are being stockpiled and shared for free — databases of CAD/CAM objects which can be numerically machined. This is starting to eleminate even the need to design the CAD/CAM file, since there’s only a limited finite number of axles or gears or engine pistons or what-have-you out there. So once the open-source shape file database gets large enough, employers will be able to download the CAD/CAM file for free and machine it numerically. The job of “machinist,” in case you haven’t guessed, is in the process of being automated out of existence. That’s why employers aren’t willing to pay machinists a decent wage. The same goes for those minimum-wage guys who used to titrate biological solutions and run gas chromatography setups. All automated by robots now. Or those guys who used to lay out phototemplate designs for integrated circuits. All automated now. Or those guys who used to design electronic circuits. Increasingly automated now by programs that take functional blocks and turn ’em into circuit schematics, then turn those into manufacturing PCB files which manufacture the circuit boards by robot (in China typically) and then feed the circuits together with a parts list to yet another robots that wave-solders that populates the board with the parts and then wave-solders it. Increasingly, all this stuff is getting automated. Legal research — offshored to temps in India or automated by legal database crawlers. Graphics design — offshored to temps in Malaysia or auomated by genetic algorithms. And so on. Modern society increasingly generates only two types of jobs: the high-level PhDs who write the software that automates the job, and the front desk minimum wage monkey who takes the orders and handles the cash register. All sad but true. But that’s the past. The next phase of automation is starting, the robot revolution. Automation affecting a far larger segment of the economy than manufacturing. See the posts listed at the end of this post. Or wait a year or so until the New York Times discovers it.